BURN CALORIES WITHOUT LEAVING THE DESK. FEEL MORE ENERGETIC. Fitting perfectly into your workstyle it takes up little to no space in your office. With ultra-smooth pedal motion, quiet operation, online calorie calculator, large adjustable pedals, and a 5-function 1000-minute display. 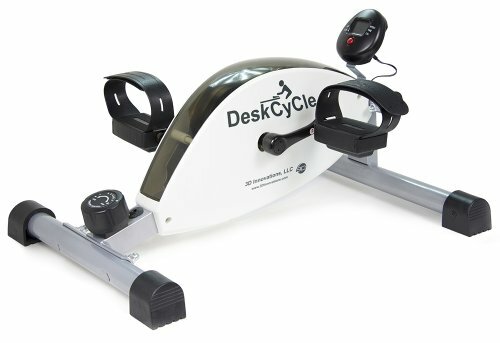 The Deskcycle has 8 levels of resistance and will help your legs to become stronger and your joints get healthier as you increase resistance, burning more calories and increase Basal Metabolic Rate (BMR). Taking it one step further than other costly bikes, the online Calorie calculation includes the physical characteristics of each user to give you a tailored accurate experience to meet your health goals. These bikes are calibrated at the factory, and the resistance is known for each position of the adjustment dial at all pedal speeds. 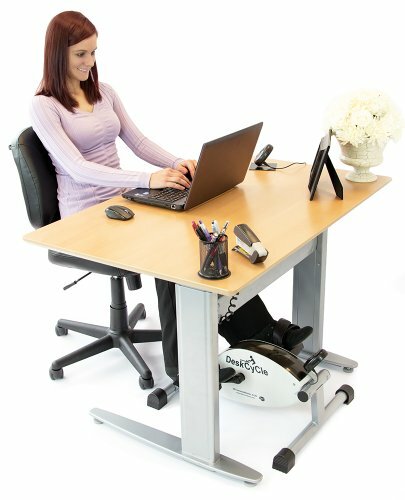 The DeskCycle has the lowest pedal height of all pedal exercisers, and can be used at a desk as low as 27 inches. Ensure you keep 2-3 inches between your knees and desk so you don’t bump your knees. Take a bubble mat to prevent your chair from rolling while using the DeskCycle. Cycle away calories from your desk!